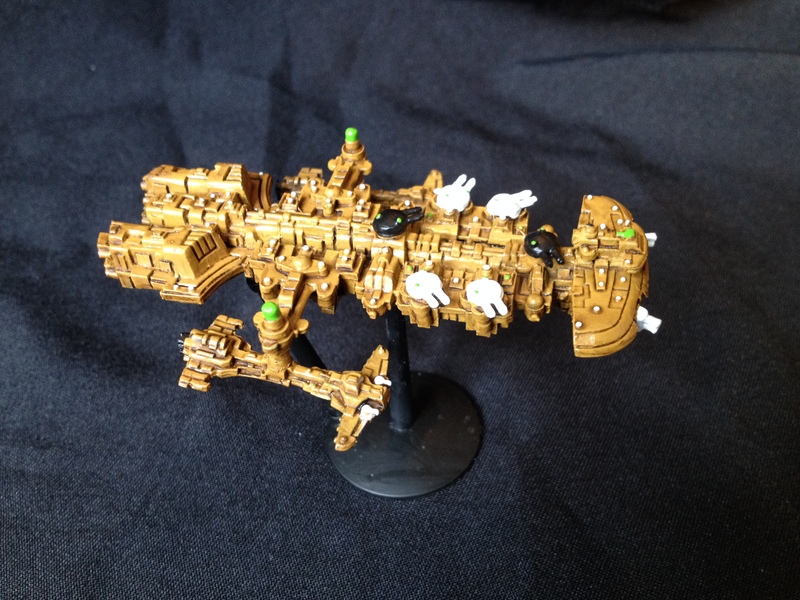 As some of you might know, I have recently been painting up some Tau ships and some Demiurge vessels for a 1,500pt fleet which makes up half of my Tau collection. This fleet is very much a themed one that relies heavily on the Demiurge in order to work. As part of this, I give you the first vessel of it, a Merchant Class Cruiser with its two attendant Orcas. The Merchant Class is an interesting type of vessel, being a re-designed merchant ship, that is poorly suited to real warfare. 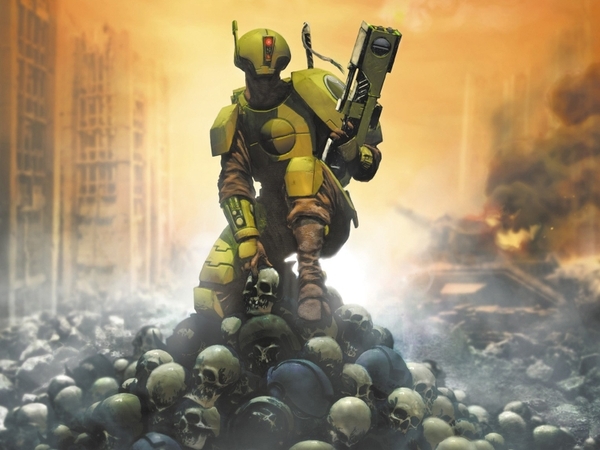 This is down to the Tau Empire’s original purpose in developing a fleet, that of trade and diplomacy rather than aggression. Of course, this doesn’t really go down terribly well in the 41st millennium, what with all the homicidal maniacs, and led to swift redesigns. I am not sure whether this was just a justification of the radically different aesthetic styles of the GW and Forgeworld Tau fleets, but it seems to make sense and adds something extra to games where you are using the Merchant Class and the rest of the GW style fleet. 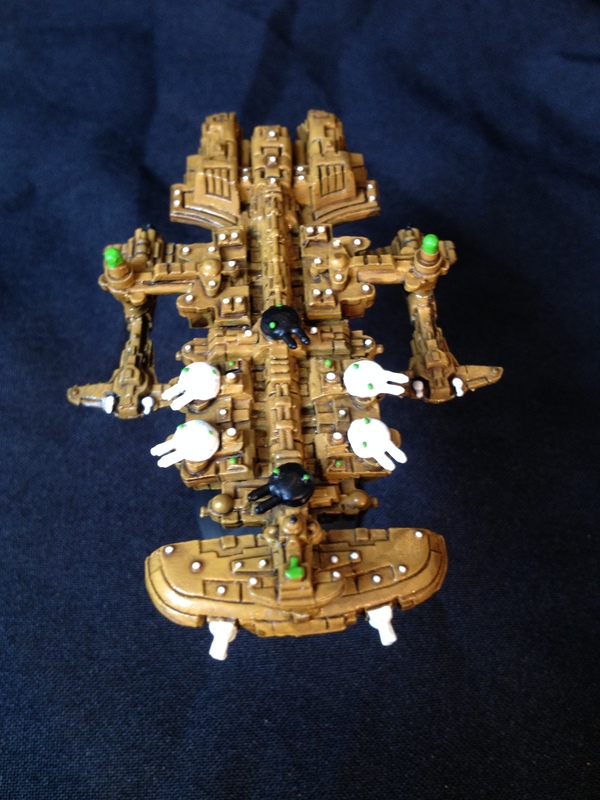 As you can probably make out, I have magnetised this cruiser to allow the Orca escorts to clip onto the gravitic hooks that the Merchant has. These are the way that the Tau fleet moves its escorts around, specifically the smaller and weaker Orcas, by enveloping them within the gravitic sheath of the warp-capable Cruiser. Well kinda, coz the fluff is a bit confused if the Tau drives actually use the warp or not…. 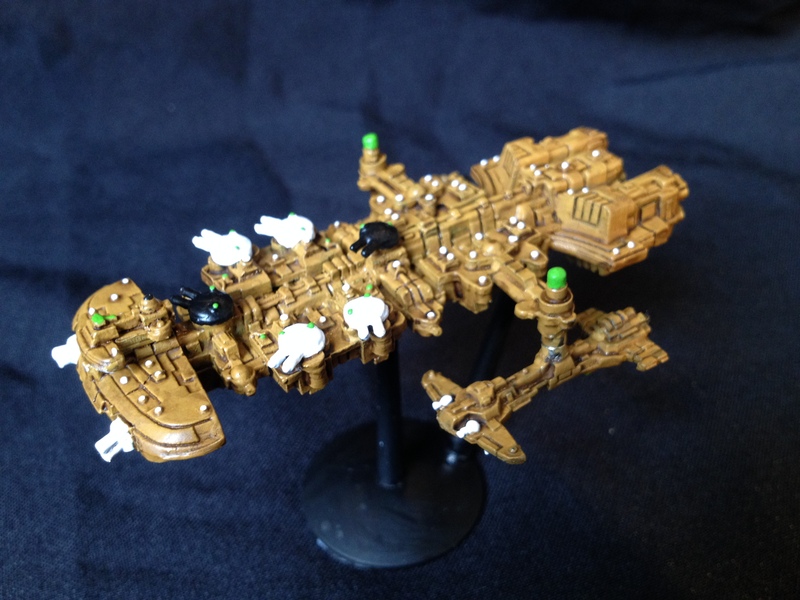 The paint jobs was just a simple classic Tau scheme in order not to draw too much attention from the Demiurge that I want to be the focus of this fleet. Painted in Tau Ochre then washed with Gryphonne Sepia before picking out details in White, Black and Scorpion Green. I am particularly pleased with how the green has worked out, providing just enough spot colour, and tying the vessels in with the Demiurge ships which also use it. 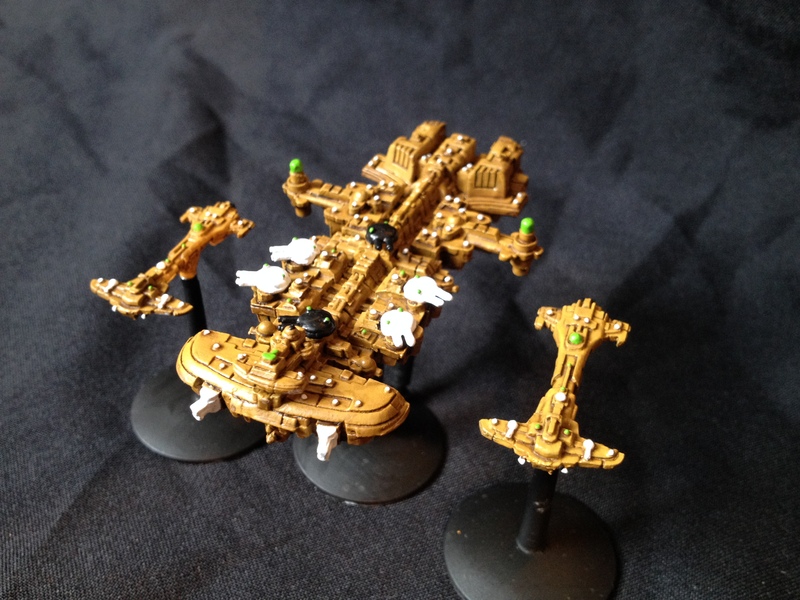 More Tau Ships to come!